My kids love peanut butter and jelly sandwiches and ask me to make one almost every day for lunch. 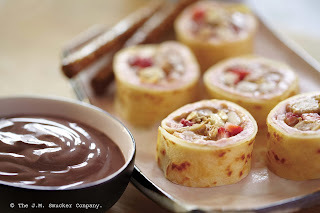 One day when I was out of bread I used a huge flour tortilla and made a peanut butter and jelly sushi roll. I was feeling very creative that day and they request it for lunch occasionally! Now through November 8th, Jif Peanut Butter is running their Most Creative Sandwich Contest - challenging families across the country to create an original sandwich recipe that includes two tablespoons of your favorite Jif products! Parents and children with 6-12 can submit their original sandwich for a chance to win a $25,000 college fund and a trip to New York City! You can enter on Jif's website. Check out this picture from one of last year's finalist, Peanut Butter Rolls Sushi Style. These look delicious and much fancier than the ones I made. I want to try to make them for my kids soon!